The “National Treasure” team consisting of producer Jerry Bruckheimer, director Jon Turteltaub and actor Nicolas Cage, bring Walt Disney’s “The Sorcerer’s Apprentice” to a new age introducing technological advancements. The story line includes a love interest, Becky Barnes (played by Australian actress Teresa Palmer) of the Apprentices Dave Stutler (Jay Baruchel) to Sorcerer and student of Merlin, Balthazar Blake (Nicolas Cage). The iconic broom scene unravels at the most inconvenient moment during a time when Dave is trying to impress Becky. In a press conference, the creators and stars of the film talked about some of the behind-the-scenes moments. In response to a question regarding the challenges of making this film, director Turteltaub stated that he had to be more prepared due to the amount of visual effects in the film. While, Bruckheimer said for him, “it’s always about the screen play”. The team went to Disney about two years ago and told them they wanted to make it in 3D. Disney’s response was, “no one’s” doing 3D. Nicolas Cage stated that he actually enjoys working in green screen. “I was really up for it” the actor expressed. While his “apprentice”, actor Jay was preparing for the famous “Fantasia” broom scene, the pressure of the reputation of that scene being “the most iconic in film history” and realizing that he was “forever going to be connected to that scene” Jay stated that he “was scared sh–less”. 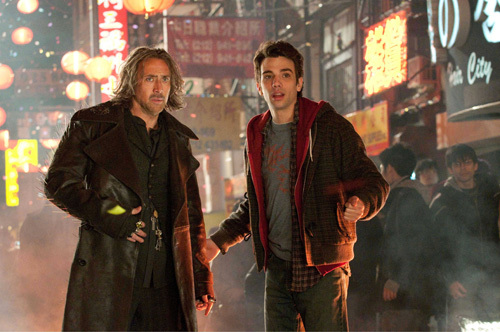 The Sorcerer (Nicolas Cage) and his apprentice (Jay Baruchel) in modern New York. Cage says that he loves working with young actors and that they “stimulate” him. He keeps learning new things from them. “I look up to Marlon Brando, Jack Nicolson…Jay has a voice (like those actors). He’s going to be around forever”. There are a number of references to Serbian physicist and inventor Nikola Tesla in the movie. There were also some real-life “coincidences” which is also addressed in the movie that the filmmakers and actors could not ignore. Turteltaub remembers as they pulled into Bryant Park where some of the scenes in the film were shot, they were on “Nikola Tesla Way”. The film was wrapped on Tesla’s birthday whom Cage shares the same birth date with. While staying in the deceased physicist’s room, Cage says he received a sign from him when a pigeon hit the window. Cage also tried to channel the spirit of Walt Disney while making “The Sorcerer’s Apprentice”. He said that he thinks Walt Disney would have been happy with this movie. Cage wrapped-up his comments during the press conference by stating that by doing this movie, he wanted to pay homage to teachers. “They want to educate people. And that’s my Father”. Walt Disney’s “The Sorcerer’s Apprentice” opens in theaters Wednesday, July 14th.